Some fish recognize the threat of predatory fish through chemical cues, which may result in variation in diel activity. 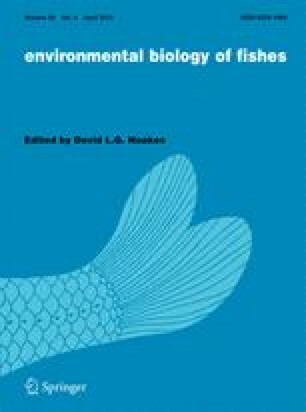 However, there is little experimental evidence of diel shifts in activity of prey fish in response to the diel activity of a predator. We compared the total prey consumed and the use of cover by common bullies (Gobiomorphus cotidianus), a native benthic feeding eleotrid, when exposed to the odour of an exotic predator, European perch (Perca fluviatilis), over a 12-h period. Our results showed no significant effect of perch odour on feeding activity, but a significant increase in the use of cover at night and a decrease in the use of cover by day. While common bullies may recognize the presence of a predator through chemical cues, dark conditions may inhibit this and other sensory mechanisms, affecting their ability to recognize the proximity of a predator. For example, during the daytime they may rely on visual cues to initiate cover-seeking behavior, but in the dark, vision is impaired giving them less warning of predators, thus potentially making them more vulnerable. The online version of this article (doi: 10.1007/s10641-011-9949-1) contains supplementary material, which is available to authorized users. We would like to acknowledge the Department of Zoology at the University of Otago for providing the equipment and laboratory resources necessary for this study. We thank Andrew Hicks and Kim Garrett for their assistance with fish collection and aquaria maintenance as well as providing input on the experimental design.